Since we started school here in Jerusalem, our September has been punctuated by near-weekly holidays. Many of these appear in the Old Testament, and it’s interesting to see them celebrated still. We started our semester at the beginning of September with Rosh haShanah, the Feast of the Trumpets (Leviticus 23:23-25). The holiday begins with a series of shofar (ram’s horn trumpet) blasts. Not only does this mark the beginning of a new year, but it is also when Jewish tradition says God rises up as a judge and determines each person’s fate and fortune for the year. You will often find four main foods on a traditional Rosh haShanah table: apples and honey to dip the apples in (for a sweet year), pomegranates (for abundance), and a fish head (for staying…ahead). The end of Rosh haShanah begins the 10 Days of Repentance, in which you try to atone for the sins you have committed by meditating, apologizing, and donating to charity. Then comes Yom Kippur (Leviticus 23:26-32), when God will decide if you have atoned properly enough to make it into the Book of Life for another year. For a 25-hour period, healthy adults must abstain from any form of work and observe a complete fast, including water. 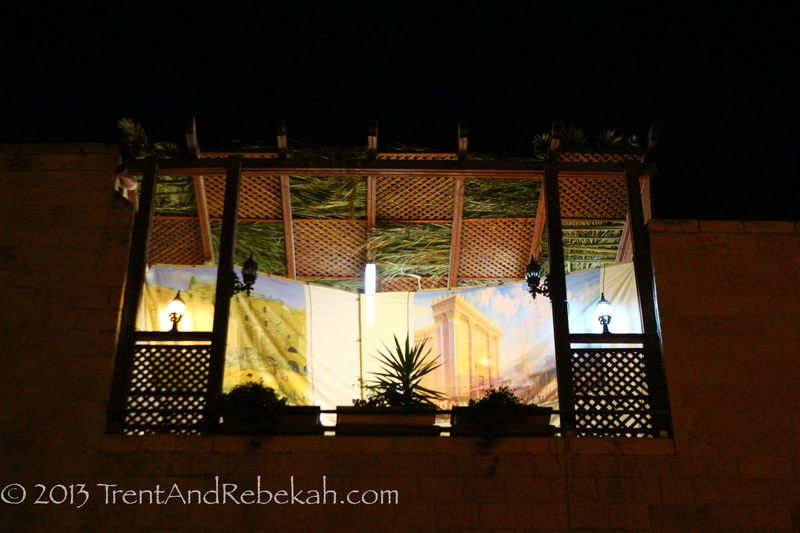 Once Yom Kippur ends (mid-September, this year), the 7 days of Sukkot begin. To show how serious you are about pleasing God, the Feast of Tabernacles (Leviticus 23:33-43) is entered into with festive zeal. Some folks will live in these pavilions, which are usually now made of tarp and PVC (with palm branches on top). Most will just eat in them, though. 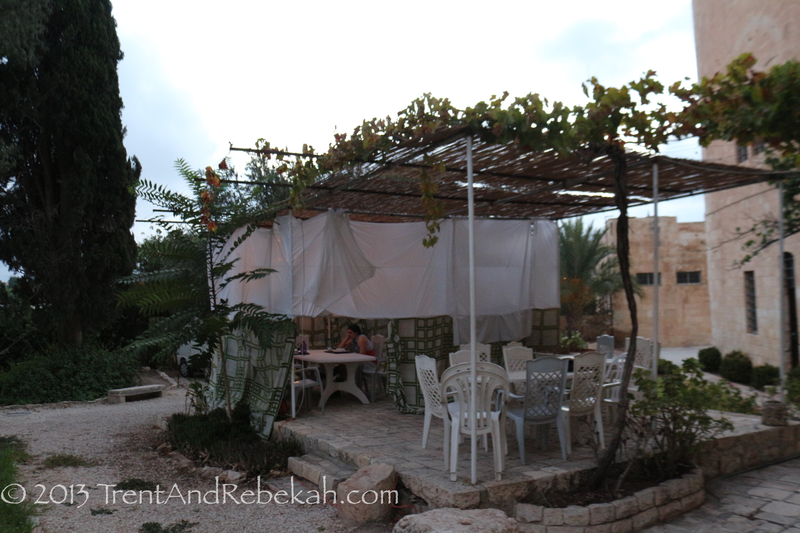 Restaurants will even build sukkots for their observing patrons. Prayers are said while waving the Four Species—palm, myrtle, and willow branches, and a citron (like a big lemon). The seventh day is when God writes your name in the book or not, so this is your last chance to be sorry. 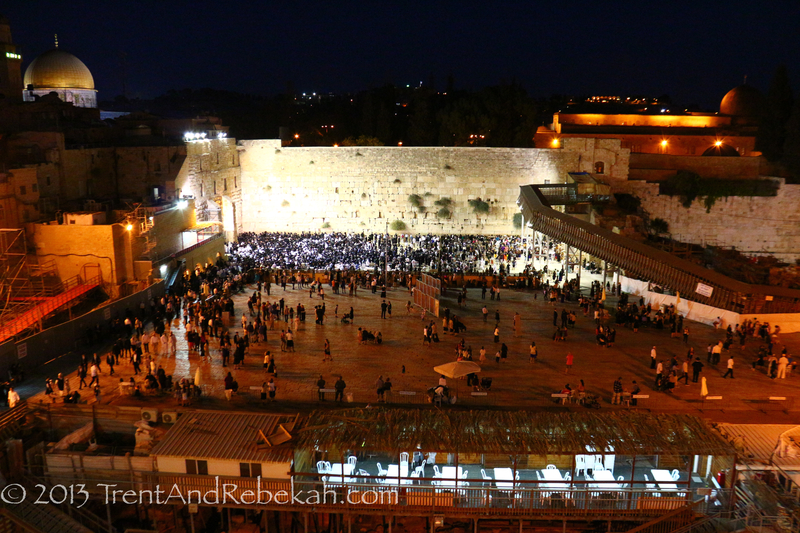 The Western Wall was busy, but hungry visitors could eat in the large sukka in the plaza. 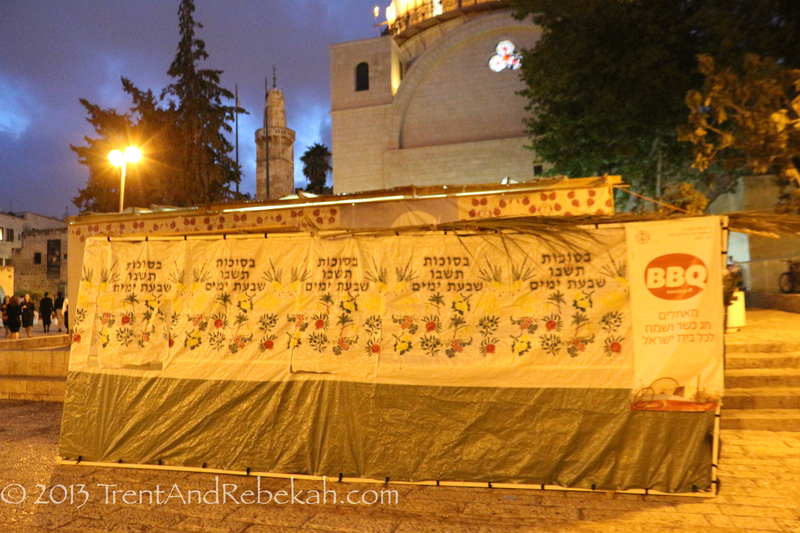 You could also see a variety of sukkot on college campuses, restaurants, and balconies. Simchat Torah is the 8th day of Sukkot, in which the Torah is brought out and everyone celebrates. The last bit of Deuteronomy is read in the yearly reading cycle, immediately followed by Genesis 1 to start the cycle over again. Much dancing is involved—both with one another and with the Torah itself. Other holidays include Hanukkah in late November or early December, an 8-day celebration of the Maccabean victory, and God’s hand in helping the cleansing of the Temple. Then there’s Purim in February or March, to celebrate Esther’s successful campaign to save her people. This is a time to enjoy food and give gifts. Some traditions also say you should drink enough alcohol that you can’t tell the difference between cursing Haman and blessing Mordecai; others, just till you fall asleep. …Shavuot! 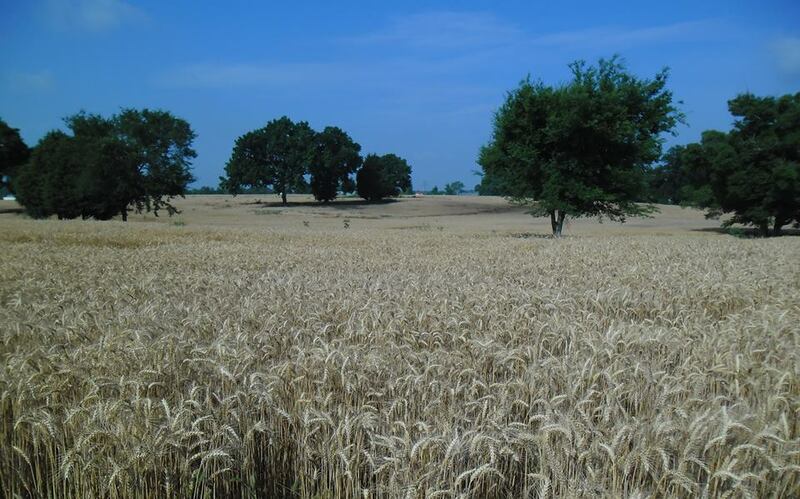 In May or June, the Feast of First Fruits (Leviticus 23:9-14) celebrates the end of the grain harvest, which began on Passover, and is the day that observers would have brought their tithe to the Temple. As the language transitioned from Hebrew to Greek in the first century, this day became known as Pentecost. A day of first fruits, indeed.